There was quite the discovery at this year’s Bioblitz in Glencarlyn Park. After a photo posted on the crowd-sourcing tracker, iNaturalist, started to spark a lot of interest, the group began to think they were onto something big — and they were. 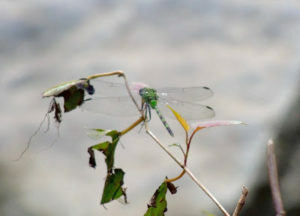 The photo was shared with several experts and the consensus was that what had been photographed was a Great Pondhawk Dragonfly (Erythemis vesiculosa). This appears to be a new state record for this mostly tropical dragonfly. While it is a very large and powerful flying dragonfly, it rarely strays North of Florida in the East.